Shallow lakes: areas of permanent or semi-permanent water with little flow (e.g. ponds, salt lakes, volcanic crater lakes). All wetlands have two characteristics in common: Water or ice and earth. Although wetlands are often wet, a wetland might not be wet year-round. In fact, some of the most important wetlands are only seasonally wet. Wetlands are the link between the land and the water. They are transition zones where the flow of water, the cycling of nutrients, and the energy of the sun meet to produce a unique ecosystem characterized by hydrology, soils,and vegetation—making these areas very important features of a watershed. Using a watershed-based approach to wetland protection ensures that the whole system, including land, air, and water resources, is protected. wetlands are lands where saturation with water is the dominant factor determining the nature of soil development and the types of plant and animal communities living in the soil and on its surface . 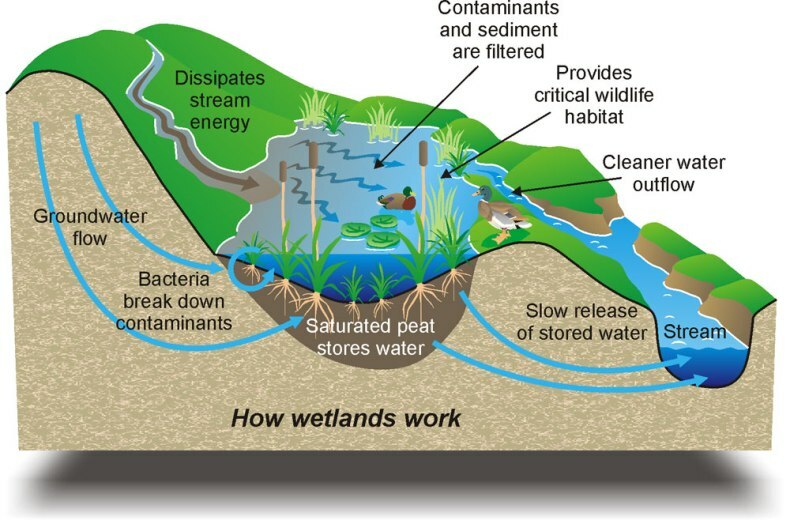 Wetlands vary widely because of regional and local differences in soils, topography, climate, hydrology, water chemistry, vegetation, and other factors, including human disturbance. 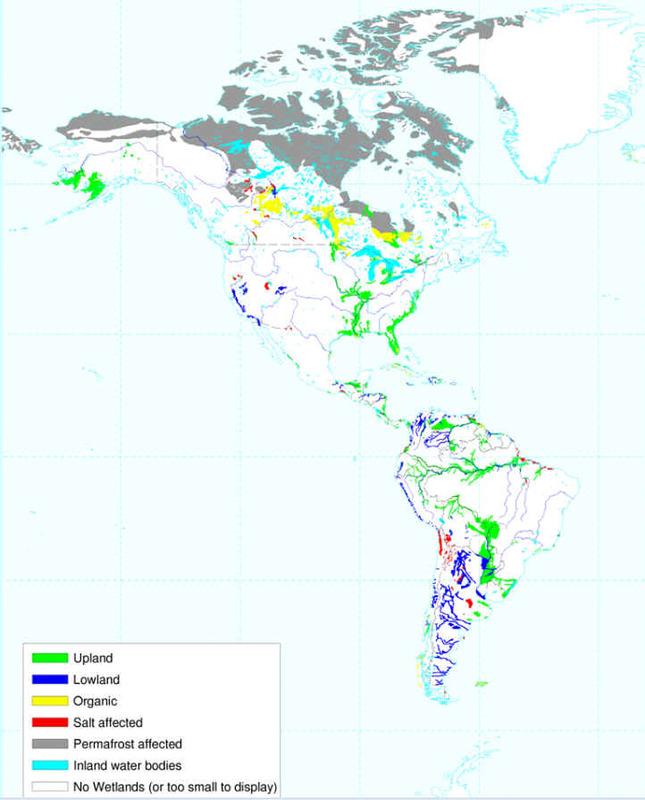 Indeed, wetlands are found from the tundra to the tropics and on every continent except Antarctica. Marshes are defined as wetlands frequently or continually inundated with water, characterized by emergent soft-stemmed vegetation adapted to saturated soil conditions. There are many different kinds of marshes, ranging from the prairie potholes to the Everglades, coastal to inland, freshwater to saltwater. All types receive most of their water from surface water, and many marshes are also fed by groundwater. Nutrients are plentiful and the pH is usually neutral leading to an abundance of plant and animal life. Marshes recharge groundwater supplies and moderate streamflow by providing water to streams. This is an especially important function during periods of drought. The presence of marshes in a watershed helps to reduce damage caused by floods by slowing and storing flood water. As water moves slowly through a marsh, sediment and other pollutants settle to the substrate, or floor of the marsh. Marsh vegetation and microorganisms also use excess nutrients for growth that can otherwise pollute surface water such as nitrogen and phosphorus from fertilizer. This wetland type is very important to preserving the quality of surface waters. In fact, marshes are so good at cleaning polluted waters that people are now building replicas of this wetland type to treat wastewater from farms, parking lots, and small sewage plants. Non-tidal marshes are the most prevalent and widely distributed wetlands in North America. They are mostly freshwater marshes, although some are brackish or alkaline. They frequently occur along streams in poorly drained depressions, and in the shallow water along the boundaries of lakes, ponds, and rivers. Water levels in these wetlands generally vary from a few inches to two or three feet, and some marshes, like prairie potholes, may periodically dry out completely. 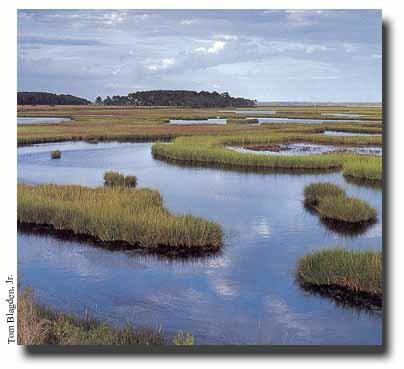 It is easy to recognize a non-tidal marsh by its characteristic soils, vegetation, and wildlife. Highly organic, mineral rich soils of sand, silt, and clay underlie these wetlands, while lily pads, cattails (see photo), reeds, and bulrushes provide excellent habitat for waterfowl and other small mammals, such as red-winged blackbirds, great blue herons, otters, and muskrats. prairie potholes, playa lakes, vernal pools, and wet meadows are all examples of non-tidal marshes. Functions & Values Due to their high levels of nutrients, freshwater marshes are one of the most productive ecosystems on earth. They can sustain a vast array of plant communities that in turn support a wide variety of wildlife within this vital wetland ecosystem. As a result, marshes sustain a diversity of life that is way out of proportion with its size. In addition to their considerable habitat value, non-tidal marshes serve to mitigate flood damage and filter excess nutrients from surface runoff. Tidal marshes can be found along protected coastlines in middle and high latitudes worldwide. They are most prevalent in the United States on the eastern coast from Maine to Florida and continuing on to Louisiana and Texas along the Gulf of Mexico. 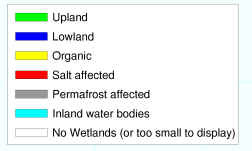 Some are freshwater marshes, others are brackish (somewhat salty), and still others are saline (salty), but they are all influenced by the motion of ocean tides. Tidal marshes are normally categorized into two distinct zones, the lower or intertidal marsh and the upper or high marsh. In saline tidal marshes, the lower marsh is normally covered and exposed daily by the tide. It is predominantly covered by the tall form of smooth cordgrass (Spartina alterniflora). The saline marsh is covered by water only sporadically, and is characterized by short smooth cordgrass, spike grass,and black grass (Juncus gerardii). Saline marshes support a highly specialized set of life adapted for saline conditions. Brackish and fresh tidal marshes are also associated with specific plants and animals, but they tend to have a greater variety of plant life than saline marshes. Functions & Values Tidal marshes serve many important functions. They buffer stormy seas, slow shoreline erosion, and are able to absorb excess nutrients before they reach the oceans and estuaries. High concentrations of nutrients can cause oxygen levels low enough to harm wildlife, such as the "Dead Zone" in the Gulf of Mexico. Tidal marshes also provide vital food and habitat for clams, crabs, and juvenile fish, as well as offering shelter and nesting sites for several species of migratory waterfowl. Pressure to fill in these wetlands for coastal development has lead to significant and continuing losses of tidal marshes, especially along the Atlantic coast. Pollution, especially near urban areas, also remains a serious threat to these ecosystems. Fortunately, most states have enacted special laws to protect tidal marshes, but much diligence is needed to assure that these protective measures are actively enforced. A swamp is any wetland dominated by woody plants. There are many different kinds of swamps, ranging from the forested red maple, (Acer rubrum), swamps of the Northeast, to the extensive bottomland hardwood forests found along the sluggish rivers of the Southeast. Swamps are characterized by saturated soils during the growing season, and standing water during certain times of the year. The highly organic soils of swamps form a thick, black, nutrient-rich environment for the growth of water-tolerant trees such as cypress (Taxodium spp. ), Atlantic white cedar (Chamaecyparis thyoides), and tupelo (Nyssa aquatica). Some swamps are dominated by shrubs, such as buttonbush or smooth alder. Plants, birds, fish, and invertebrates such as freshwater shrimp, crayfish, and clams require the habitats provided by swamps. Many rare species, such as the endangered American crocodile depend on these ecosystems as well. Swamps may be divided into two major classes, depending on the type of vegetation present: shrub swamps, and forested swamps. Due to the nutrient-rich soils present in swamps, many of these fertile woodlands have been drained and cleared for agriculture and other development. Over 70 percent of the Nation's floodplain forested swamps have been lost. Historically, swamps have been portrayed as frightening no-man's-lands. This perception led to the vast devastation of immense tracts of swampland over the past 200 years, such as the destruction of more than half of the legendary Great Dismal Swamp of southeastern Virginia. 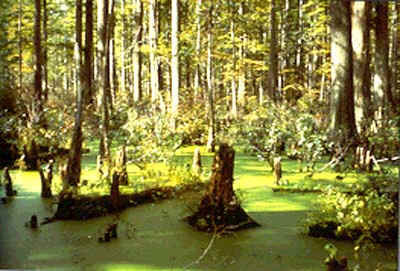 Forested swamps are found throughout the United States. They are often inundated with floodwater from nearby rivers and streams. Sometimes, they are covered by many feet of very slowly moving or standing water. In very dry years they may represent the only shallow water for miles and their presence is critical to the survival of wetland-dependent species like wood ducks (Aix sponsa), river otters (Lutra canadensis), and cottonmouth snakes (Agkistrodon piscivorus). Some of the common species of trees found in these wetlands are red maple and pin oak (Quercus palustris) in the Northern United States, overcup oak (Quercus lyrata) and cypress in the South, and willows (Salix spp.) and western hemlock (Tsuga sp.) in the Northwest. Bottomland hardwood swamp is a name commonly given to forested swamps in the south central United States. Shrub swamps, are similar to forested swamps, except that shrubby vegetation such as buttonbush, willow, dogwood (Cornus sp.) , and swamp rose (Rosa palustris) predominates. In fact, forested and shrub swamps are often found adjacent to one another. The soil is often water logged for much of the year, and covered at times by as much as a few feet of water because this type of swamp is found along slow moving streams and in floodplains. Mangrove swamps are a type of shrub swamp dominated by mangroves that covers vast expanses of southern Florida. Bogs are one of North America's most distinctive kinds of wetlands. They are characterized by spongy peat deposits, acidic waters, and a floor covered by a thick carpet of sphagnum moss. Bogs receive all or most of their water from precipitation rather than from runoff, groundwater or streams. As a result, bogs are low in the nutrients needed for plant growth, a condition that is enhanced by acid forming peat mosses. There are two primary ways that a bog can develop: bogs can form as sphagnum moss grows over a lake or pond and slowly fills it (terrestrialization), or bogs can form as sphagnum moss blankets dry land and prevents water from leaving the surface (paludification). Over time, many feet of acidic peat deposits build up in bogs of either origin. The unique and demanding physical and chemical characteristics of bogs result in the presence of plant and animal communities that demonstrate many special adaptations to low nutrient levels, waterlogged conditions, and acidic waters, such as carnivorous plants. Bogs serve an important ecological function in preventing downstream flooding by absorbing precipitation. Bogs support some of the most interesting plants in the United States (like the carnivorous sundew), and provide habitat to animals threatened by human encroachment. Bogs in the United States are mostly found in the glaciated northeast and Great Lakes regions (northern bogs), but also in the southeast (pocosins). Their acreage declined historically, as they were drained to be used as cropland, and mined for their peat which was used as a fuel and a soil conditioner. Recently, bogs have been recognized for their role in regulating the global climate by storing large amounts of carbon in peat deposits. 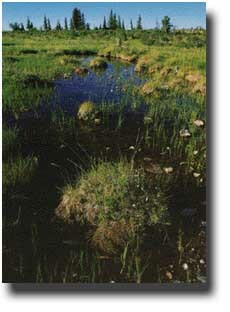 Bogs are unique communities that can be destroyed in a matter of days, but require hundreds, if not thousands, of years to form naturally. Northern bogs are generally associated with low temperatures and short growing seasons where ample precipitation and high humidity cause excessive moisture to accumulate. Therefore, most bogs in the United States are found in the northern states. Northern bogs often form in old glacial lakes. They may have either considerable amounts of open water surrounded by floating vegetation or vegetation may have completely filled the lake (terrestrialization). The sphagnum peats of northern bogs cause especially acidic waters. The result is a wetland ecosystem with a very specialized and unique flora and fauna that can grow in these conditions called acidophiles. Nevertheless, bogs support a numberof species of plants in addition to the characteristic sphagnum moss, including cotton grass, cranberry, blueberry, pine, Labrador tea, and tamarack. Moose, deer, and lynx are a few of the animals that can be found in northern bogs. The greater sandhill crane, the sora rail, and the great gray owl depend on bogs for survival. The word pocosin comes from the Algonquin Native American word for "swamp on a hill". These evergreen shrub and tree dominated landscapes are found on the Atlantic Coastal Plain from Virginia to northern Florida, though most are found in North Carolina. Usually, there is no standing water present in pocosins, but a shallow water table leaves the soil saturated for much of the year.They range in size from less than an acre to several thousand acres located between and isolated from old or existing stream systems in most instances. Because pocosins are found in broad, flat, upland areas far from large streams, they are ombrotrophic like northern bogs, meaning rain provides most of their water. Also like the bogs of the far north, pocosins are found on waterlogged, nutrient poor, acid soils. The soil itself is a mixture of peat and sand containing large amounts of charcoal from periodic burnings. These natural fires occur because pocosins periodically become very dry in the spring or summer. The fires are ecologically important because they increase the diversity of shrub types in pocosins. The most common plants are evergreen trees (loblolly bay, red bay, and sweet bay), and evergreen shrubs (titi, fetterbush, and zenobia). Pocosins provide important habitat for many animals, including some endangered species like the red-cockaded woodpecker. They are especially important as the last refuge for black bears in coastal Virginia and North Carolina, and the red wolf has recently been reintroduced in North Carolina pocosins. Habitat is the most valuable function of Pocosins. Some pocosins are very large and difficult to develop, and so they remain largely undisturbed. As a result, they are a haven for species adapted to living in unaltered forests. As more and more land is developed in the Eastern United States, pocosins are becoming ever more valuable refuges for wildlife. The slow movement of water through the dense organic matter in pocosins removes excess nutrients deposited by rainwater. The same organic matter also acidifies the water. This very pure water is slowly released to estuaries, where it helps to maintain the proper salinity, nutrients, and acidity. This process is important to help maintain healthy fish populations important to both commerce and recreation. Pocosins are also sources of valuable timber and fuel, but these uses can harm or destroy pocosins if they are not carried out responsibly. About 1,400 square miles of undisturbed pocosins remain today. By comparison, more than 3,000 square miles were drained between 1962 and 1979. Historically, pocosins were mostly threatened by agriculture. Today, timber harvesting, peat mining, and phosphate mining join agriculture as the biggest threats to the remaining undisturbed pocosins. Fens, are peat-forming wetlands that receive nutrients from sources other than precipitation: usually from upslope sources through drainage from surrounding mineral soils and from groundwater movement. Fens differ from bogs because they are less acidic and have higher nutrient levels. They are therefore able to support a much more diverse plant and animal community. These systems are often covered by grasses, sedges, rushes, and wildflowers. Some fens are characterized by parallel ridges of vegetation separated by less productive hollows. The ridges of these patterned fens form perpendicular to the downslope direction of water movement. 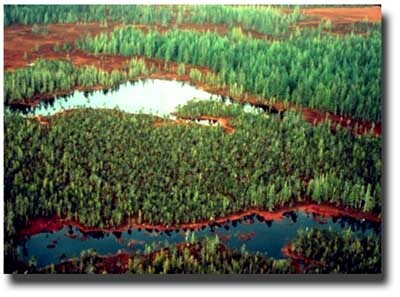 Over time, peat may build up and separate the fen from its groundwater supply. When this happens, the fen receives fewer nutrients and may become a bog. Like bogs, fens are mostly a northern hemisphere phenomenon -- occurring in the northeastern United States, the Great Lakes region, the Rocky Mountains, and much of Canada -- and are generally associated with low temperatures and short growing seasons, where ample precipitation and high humidity cause excessive moisture to accumulate. Functions & Values Fens, like bogs, provide important benefits in a watershed, including preventing or reducing the risk of floods, improving water quality, and providing habitat for unique plant and animal communities.